2016 Chinese New Year Day will arrive on February 8, 2016. Chinese Year of Monkey begins on February 4, 2016 according to Chinese Astrology Calendar. 2016 is the Year of Fire Monkey. Fire is connected to the color of red. Therefore, 2016 is also called Year of Red Monkey. 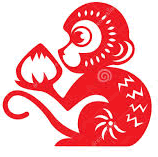 The Chinese astrology symbol for 2016 Red Monkey Year is . Before predicting your 2016 fortune regarding to your money, career, marriage or health, you have to know what Type of Element you are and what your Lucky Element is. The Lucky Element is the major factor to determine people's good fortune. 2016 is the Year of the Red Fire Monkey, which contains Metal, Water and little Earth. If your Lucky Element is Metal or Water, then 2016 will bring you some degree of fortune. The strongest element of 2016 is Metal. Therefore, people whose lucky element is Metal will get most benefits in 2016. The element of Water is also shown strong in 2016. People whose lucky element is Water will have a wonderful Monkey year, too. 2016 is Male Fire Monkey year. Monkey contains mainly Metal and Water. Since Metal is the lucky element, Metal will bring fortune to this person. Metal represents money. Therefore, this person has good money luck in the Monkey year. Water represents the career or business. That implies the career opportunity is coming. Male Fire of 2016 represents the siblings or friends, which are connected to social activities and money expenses. Before this person brings in money into the packet, he or she needs to invest money on some persons. In short, that is the sign of money out and in. 2016 is the Year of Monkey. This is the first year of the Metal cycle. If your lucky element is Metal, then the next three years will be good. 2013 of Snake, 2014 of Horse and 2015 of Sheep are Fire years. If you did well last three years because of Fire, then your luck hasn't ended yet. 2016 contains Male Fire, which can extend your fortune. Monkey contains mainly Metal and Water. People whose lucky element is Metal, Water or Fire will have some good luck in the Red Monkey year. In Chinese astrology, August is the Monkey month, which is the beginning of windy season. Therefore Monkey is connected to wind too. The following table shows people's luck in 2016 based on their Luck Element. If Metal is your Lucky Element, then 2016 is a very good year to you. Monkey of 2016 contains mainly Metal. Metal and Fire are opposite elements. Fire of 2016 will bring little pressure on the Metal. You won't see too much luck during the first half of 2016. After summer, Metal will be very active, your luck will become extremely good. Everything will come your way in the second half of 2016. Monkey is related to the wind. Male Fire of 2016 is also related to the Sun. The Sun can change the temperatures to generate the air current, then form the strong wind. Strong wind could become a hurricane, then it will cause people's property loss. Therefore, you need to watch unexpected accident. In your health, you also need to pay attention on your respiratory system, because Metal is connected to air and lungs. If Water is your Lucky Element, then 2016 is a good year to you. Monkey of 2016 contains Metal and Water. Metal is the mother element of Water. That means both Metal and Water are good for your birth chart. Metal is strong in the fall and Water is strong in the winter. Fire of 2016 is not strong because Monkey contains Water. The first half of 2016 will be fair. Your fortune will take off after summer. If Wood is your Lucky Element, then your luck in 2016 is fine. Metal of Monkey is unfavorable to Wood. But Water of Monkey is the mother element of Wood. Water will protect Wood if Metal wants to attack Wood. Fire of 2016 is related to the Sun, Sun can provide energy to Wood (tree) and make Wood stronger. The first half of 2016 should be stable. If you encounter a trouble in the second half of 2016, then you should be able to find a helper or savior around to solve your problem. Therefore, you will be doing fine in 2016. If Fire is your Lucky Element, then your luck in 2016 is fine with little hidden trouble. Fire of 2016 will bring your luck during the first half. You will have better luck during the summer. Monkey contains Metal and Water, which are unfavorable to Fire. That means your Lucky Element will be weaker after summer. You should become conservative during the second half of 2016. Don't do the risky investment in the fall and winter. If Earth is your Lucky Element, then your luck in 2016 is average. Fire of 2016 is the mother element of Earth. If Earth encounters trouble, Fire will appear to protect Earth. Actually Monkey also contains little Earth. Therefore, your luck is not strong, but it will come once for a while. Red Monkey cannot bring you exciting good news. Earth is afraid of Wood. There is no Wood inside the Monkey. That means Monkey of 2016 shouldn't bring you you big trouble. The following table informs people's what event may occur in 2016 based on their Day Master Element Type. Day Master is the upper row symbol in the Day Column of the Birth Chart. 2016 is Male Fire Monkey year. Fire of 2016 represents your job, career, boss, police or law. Your behaviors or activities will encounter some restrictions. Or your work at company will bring you some pressures. But you should be able to handle the challenge because of Monkey. 2106 should be a year of career opportunity to you. If your Day Master is the Female Metal , then Day Master and Male Fire of 2016 have Attraction Relationship into Water. People relationship will be good. The reputation related events will automatically come toward you in 2016. If you are a female, that is also a good sign of the love relationship. Monkey of 2016 contains mainly Metal. Metal presents your siblings, friends or same generation relatives. Therefore, 2016 will be busy year for you to hang around your old and new friends. That's a sign of money opportunity. Friends might advise and inform you the location of treasure or possible money luck, so you know where to get it. But be careful, it might be the other around. If you have strong Metal in your birth chart, then your friends may want you to share or steal your money. In short, if Metal is your lucky element, then it will bring you extra income. If Metal is an unlucky element, then money loss is possible. Monkey of 2016 also contains some Water. Water represents your appearance, performance, or expression. That means you will contact with friends and share your thoughts with others. If your birth chart has little Water, then you will become a popular person in your group. If you birth chart already has too much Water, then people might give you a negative reputation because they think you are creating noises. 2016 is Male Fire Monkey year. Fire of 2016 represents money or wealth to you. Therefore a money event will appear in 2016. If you have strong Water in your birth chart, then you will have very good money luck. You will receive financial assistances from your friends or relatives. You should have a good chance to increase your income, investments and wealth. But if you have a weak Water in the birth chart, then you will feel pressure related to money soon or later. If you are male, the Fire of 2016 also represent girls to you. If you are a single male, then you have good opportunity to meet potential girls during the first half of 2016. Monkey of 2016 contains Metal, which related to your parents, elders, education, knowledge, or health. Therefore, you will spend some time to contact with your parents and elders. Or you might focus on education to expand your knowledge and skills. Also, you might watch your health more often. Metal is the mother element of Water. 2016 will bring you more energy, safety, protection, and give you better health and stronger determination. Monkey of 2016 also contains Water, which represents your friends, siblings, or same generation relatives. You will spend some times with them in the 2016. If your Water is weak in the birth chart, then he will receive help from them whenever you encounter the troubles. If your Water is strong in the birth chart, then you might have to give your relatives or friends financial aid. You shouldn't have any risky investments with them or provide them with a short-term loan. Unless, they need money for their health, education or special issues. 2016 is Male Fire Monkey year. Fire is the child element of Wood. Fire of 2016 represents your outlook, performance, speech, behavior, freedom or expression. That means 2016 is the time to stand up to show yourself to others. Your social life will become a little bit busier. If you become popular, people will know you better. Therefore, Wood also relates to your fame or reputation. If people appreciate your mannerisms, then you should earn a good reputation. If people don't like your ways, then people will give you a negative reputation. Monkey of 2016 also contains mainly Metal, which presents the career, pressure or law. If you have strong Wood in your birth chart, then both of your money and career luck will be great in 2016. If Wood is too weak in your birth chart and cannot face the challenge from pressures of money and career, then bad health might come after. If people cannot properly manage money, then there is a chance to encounter a lawsuit because of money. Monkey contains some Water, which represents your parents, teachers, support, protection or knowledge. If you encounter troubles or difficulties in your career, then somebody around or your savior will appear to help you. If your Day Master is Female Wood. , then Female Wood and the Metal of Monkey have attraction relationship. That's a sign of good love relationship. If you are a single female, then you should look for your love in 2016. If you are in love, then you can plan for the deeper relationship. 2016 is Fire Monkey year. Fire of 2016 represents your friends, siblings, or same generation relatives. That implies you will keep in touch with them. Your social activities will increase. Friends or relatives together could involve the money. If your Fire is strong in the birth chart, then your relatives or friends will bring money trouble to you. You should keep the distance with them when talking about the big return risky investment. But if your Fire is weak, then they will help you to find the earning money opportunity. The main element of Monkey is Metal. Metal represents your money, finance or wealth. Monkey also contains Water, which stands for your job, career, pressure and law. Therefore, your job and income are tied together. If your Day Master Fire is strong, then you will feel more responsibilities and opportunities at work and your income will increase. Bit if your Day Master Fire is weak, then you will have trouble to fight with your career and money. That means career and money bring you pressures. You feel too much workload or troubles at work and feel short of money often. However, it shouldn't be too bad, because Fire of 2016 is related to your friends and they will help you when you are in trouble. If you are a female, then Water inside the Monkey represents your boyfriend or husband. If you are a male, then the Metal inside the Monkey represents your girlfriend or wife. That means people whose Day Master is Fire has potential in good love relationship. If you are single, then try to attend more social events. Certainly, there is competition out there. 2016 is Fire Monkey year. Fire of 2016 represents your parents, mentors, elders, protection, knowledge, education or medicine. You will regularly contact your parents or persons who care you. Or you will spend more time learning. Or you will pay attention to your health. Or you are planning to buy a valuable property. Or you feel lots of support and help at work. Monkey contains mainly Metal. Metal represents your outlook, performance, expression or behavior to people. That means you should have an opportunity to perform and show off. If your birth chart already contains lots of Metal, then people around you will criticize you talking too much. If your birth chart only has little Metal, people will listen when you talk and send you compliments. Either way, you will feel relaxed, free, and joyful. Monkey of 2016 also contains Water. Water is related to you money. Metal of Money is the mother element of Water. That means your good appearance, behavior, idea and reputation could bring you a good income. If you are a man, then Water is also connected to your girlfriend or spouse. Therefore, if you are single male, then you have good potential to meet a nice girl. There is no Wood inside the Monkey. Wood stands for the job, career and pressure to you. That implies there is not too much change in your career path.